Cut to the core | Yanomami-Hilfe e.V. Gold miners in the Brazilian Amazon are destroying the Yanomami community’s home. But, says Davi Kopenawa, his people are ready to fight for their land. Please tell journalists that the invaders are increasing. Europeans need to know what’s happening. The world needs to know that we are being invaded again lots of planes and helicopters and boats we need action urgently! We need to get the gold miners out! This is why Davi has come to London. An estimated 3,000 gold miners are now working illegally in Yanomami land, and they threaten to undermine the community’s entire way of life. They come on illegal runways and bring food and material for mining, Davi explains. They cut the trees and make holes about three or four metres deep. All the dirt that comes out fills the river, and the mercury they use is dangerous. The fish get ill and die and the animals that drink the water also die. The huge puddles of dirty water they leave behind spread malaria because they attract mosquitoes. We get ill from bathing and drinking. This is why I have come to Europe Im going to try talking to politicians to see if they can put pressure on the Brazilian Government to stop this! The Yanomami people are used to fighting for their land. In the late 1980s, the community took up bows and arrows against a wave of gold miners, but many were killed at the trigger of modern handguns. The intruders were eventually driven out, but Davi estimates that he lost a quarter of his people, some 4,000 lives, to handguns and illnesses brought in from the outside. As a Shaman, a community healer for his people, this cut Davi to the core. His natural medicines that worked so well on traditional ailments were hopeless in the face of malaria, pneumonia and bullets. I can tell you the story of our way of living and teach you our language, but we have a different way of thinking. We think as well as speak differently. Its difficult for you to understand Today, Davi says that his community is prepared to fight again: If they exterminate the people theres going to be revenge. Our world will fight back against the white people and the cities. There will be lots of misery if we lose our land the rain, wind and thunder will fight on our behalf. We will not die alone we will make others die too. Without our indigenous people the world can’t function! Whether he’s relying on superstition or the science of climate change to deliver this justice is difficult to tell, but his conviction is impossible to doubt. Gold mining is not the only threat faced by this community. 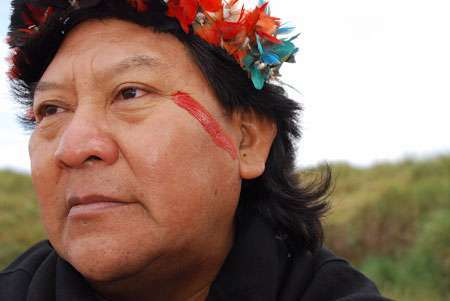 Davi tells me that three military barracks have already been built on Yanomami land by order of the Brazilian Government, and that more are planned for the border with Venezuela. The barracks are allegedly to bolster national security, but they are more likely to please the US, which is anxious to support any policy that threatens Venezuelan President Hugo Chávez. At best, the Yanomami people will have their way of life disrupted by more illness and intrusion; at worst, they’ll be caught in a crossfire beyond their control. We don’t have holidays or weekends every day is the day of the individual person. I would like to teach you how we people of the land eat and live, taking care of our land and forests and rivers, and our way of working with machines without engines. I can tell you the story of our way of living and teach you our language, but we have a different way of thinking. We think as well as speak differently. It’s difficult for you to understand. But it would be a mistake to romanticize indigenous life in the Brazilian Amazon. Divisions of labour still exist, and more often than not they are inflexibly drawn along the lines of gender and tradition. Men go hunting, build houses and transport materials; women clear the land, work the vegetable plots and take care of the house. If an individual in the community doesn’t like this way of life, its hard for them to leave. In the city indigenous people don’t have support they don’t have free houses, they don’t have jobs. Here we allow people to learn to read and write in Portuguese and to use a computer, but we can’t allow them to leave, says Davi. But without international pressure, the Yanomami people may have no choice but to take their chances in Brazil’s already overcrowded cities. 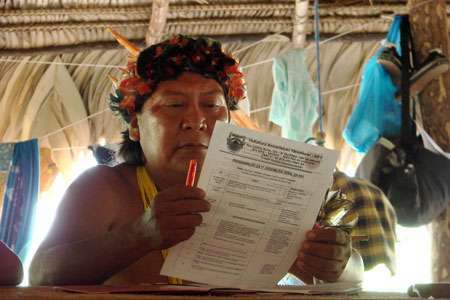 Without formal qualifications or cultural acclimatization, Davi is right to suspect that his people will fall from being proud, safe guarders of the rainforest to just another community in the countrys poverty-stricken slums. Many of the Yanomami people are prepared to die to prevent that happening, but to succeed, they will need our support. This entry was posted in Hutukara and tagged Amazon, culture, Davi Kopenawa, indigen, indigenous, Malaria, medicine, plane, rainforest, Venezuela on 1. November 2009 by Webmaster.